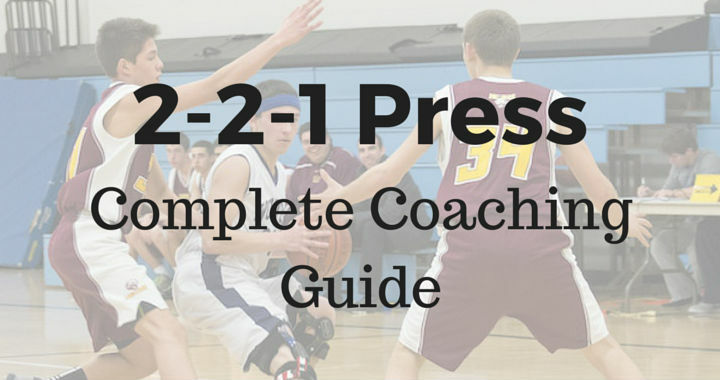 The 2-2-1 press is traditionally a 3/4 court press. It gives your team great trapping opportunities while being a good press for containment and not allowing easy scores on the other end of the floor. Like all presses, the 2-2-1 press is best run against teams that lack a true point guard and aren’t great dribbling or passing teams. It’s also fantastic for getting the ball out of the point guards hands and into the hands of a player less confident dribbling and bringing up the basketball. For better or for worse, the 2-2-1 press is very effective in youth basketball because it takes advantage of most players lack of strength to pass over the top of the press. 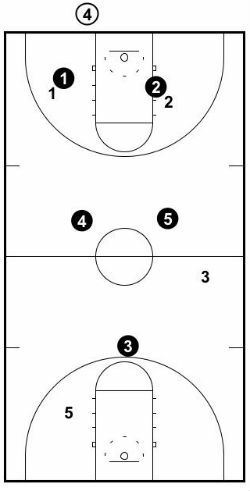 The 2-2-1 floods the front court with 4 players and forces the offense to beat the press with smart cuts and passing (which is hard for most youth players to do). Players running the 2-2-1 press in older age groups have to play smarter in order to not allow the pass over the top and easy layup. To put it simply, the goal of the press is to keep the ball out of the middle of the court and force the opponent to play down the sidelines. On the sidelines we set traps and our goal is to force the passer to make a tough pass over the top of our trap that we can intercept. The 2-2-1 press forces the opponent play at an uncomfortable pace. On one end of the floor they’re forced to be slow and deliberate to bring the ball up the court, but once it’s been advanced it often leads to the opponent taking tough and rushed shots. By taking away long passes and forcing the offense to be deliberate with the ball and make smart passes and ball reversals, it’s going to wipe a lot of time off the shot clock and potentially force a backcourt violation. Since the 2-2-1 has great trapping opportunities, if your players trap correctly it will lead to the opposition turning the ball over. Man-to-man can be seen as an individual defense to some players. When players are in a team press like the 2-2-1, it means you have to trust your teammates and work as a unit. When there’s a steal using this press it’s because everyone put in the hard work. For whatever reason, I can confidently say that players play much harder when your team is implementing a press. It’s physically and mentally tough to play against a press. When your team is running a press the opposition never has time to relax. Both teams must be willing to play their bench plenty of minutes. Once the ball makes it to the middle of the floor it becomes very hard for the press. Our steals don’t come from the trap, they come from the trap forcing the player with the ball to throw a lob pass to the teammate that gets picked off. Never foul on a trap! Defenders trapping must move their feet into position and not reach or slap at the ball with their hands as this will often result in a foul. 3. If the press is beat, sprint back. What you do when the press is beaten will depend on the age and experience level of the team you coach. For older players, the closest player should stop the basketball while the the other four defenders find a player. For younger players, my rule is the closest player attempts to stop the ball and the other four must first get to the key before finding their player. We do this because we don’t want to allow any layups. We would much prefer an opposition player get a wide-open outside shot than an uncontested layup. I’ll give you a brief overview of how the 2-2-1 press is set up and the order in which you should choose the positions in the press before discussing the roles and responsibilities of each position. X1 and X2 are usually the two guards on the team and make up the front line of our defense. They will both start on the elbows. Out of the other three players, you need to decide which one is best at reading the play and intercepting the basketball. That player should be in the back line since this is where most of the steals will come from. For this example, we’ll assume it’s X3. This player’s starting position will depend on how quick they are and their ability to know when to gamble for steals but will usually start at about the three-point line. The middle line is made up of the other two players on the team. Usually two big players since these players will be the ones protecting the ring. For this example we’ll assume it’s X4 and X5. These players start a step or two inside of half court. The responsibility of the front line player on ball-side is to pressure the dribbler after the catch and force them down the sideline where we can trap the ball. The responsibility of the weak-side front line player is to be in help position where they can assist if the on-ball defender is beaten down the middle off the dribble, and also prevent direct passes down the middle of the press. Once the trap is set by the ball-side front line player, the weak-side front line player becomes one of the two interceptors in the press and must move to the middle of the floor. It’s imperative that these players are able to put pressure on the basketball and channel the ball-handler down the sideline without getting beaten off the dribble. This containment is the most crucial part of the press. The key is to keep a bit over an arms-length distance away from the offensive player and force them to play slow and methodical. 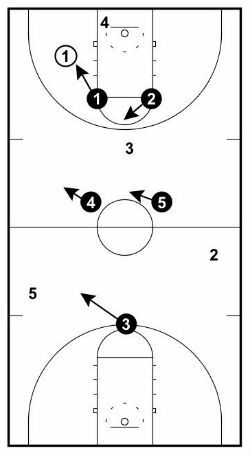 Full court one on one drills like this drill from Breakthrough Basketball and this drill from Stack one are great for practicing and teaching this. The reason we pressure the player with the ball is that if the front-line players stand off the offensive player with the ball it becomes too easy for them to survey the floor and make passes through the middle of the press. Whereas if they move up and pressure the ball when it’s inbounded, it will make it much harder for the point guard to make smart decisions. The ball-side second line is responsible for trapping the basketball and forcing the opposition to make a lob pass over the top that can be intercepted. The weak-side second line player is responsible for falling back and protecting the ring. The single person in the back line’s primary responsibility is to intercept the basketball. They will always an interceptor in the press along with the weak-side front line player. As talked about in the initial setup, this position should be the best player on your team at reading the play and intercepting the ball since they will get plenty of opportunities to do so. They will also be the main communicator during the 2-2-1 since they have vision of the entire floor. Traditionally, we do not deny the inbounds pass in the 2-2-1 press. Instead, we start the two front line defenders (X1 and X2) on the high posts and wait until the ball has been passed in before picking up the player with the basketball. This plays to our advantage in slowing the ball down and potentially getting a backcourt violation. Instead, we start the two front line defenders (X1 and X2) on the high posts and wait until the ball has been passed in before picking up the player with the basketball. This plays to our advantage in slowing the ball down and potentially getting a backcourt violation. When the ball is inbounded the closest guard (X1) must put pressure on the ball. We don’t want to allow their point guard to survey the floor and make easy reads as to where they should pass it to. When the closest guard closes to defend the ball-handler, they must position their body in a stance that forces the offensive player towards the sideline (where our traps will occur). The player on the front line weak side (X2) slides across to the middle of the floor and denies the pass to any offensive player in the middle of the floor. We try to never allow the offensive player back to the middle of the floor. If they do dribble middle past the on-ball defense, it’s the weak side front line players job to come across and help and make them pass back to the sideline. The player strong-side in the second line (X4) must move across to be in-line with the basketball and the weak-side second-line player (X5) must move across and guard the middle of the court. The last man back (X3) should always be in-line with the basketball and be ready to pick off any long passes made over the top. What happens if the ball is reversed? If the ball is reversed back to the middle of the floor all players should be back to the original 2-2-1 press positions. 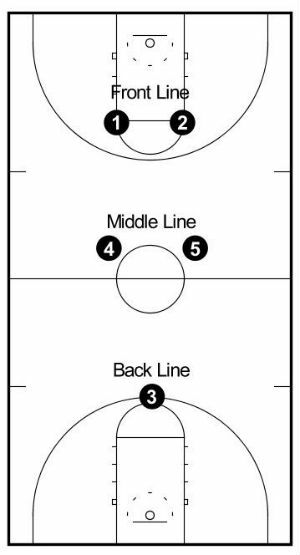 The front line should be on the high posts with hands high to discourage vision and a pass down the middle of the floor. We don’t mind the ball reversal because they’re not making progress as the clock gets closer and closer to a back-court violation. The goal is to get the ball back on one of the sidelines. When a pass is made to the sideline, the closest front-line player picks up the ball and once again forces it down the sideline. Once the offensive player is forced to the sideline it’s time for the middle-line to help and trap the ball. As the dribbler nears the second-line, the strong-side second-line player (X4) moves up to set the trap with the on-ball defender (X1). It’s imperative that the second-line player coming to trap doesn’t allow the offensive player to get around and break the trap or else the defense will now be at a huge disadvantage. The trap can be made anywhere between the free-throw line and half court. On the trap, the two defenders must not foul. I can’t stress this point enough… Never foul on the trap. The goal of the trap is not to steal the basketball but to force the player with the ball to make a lob pass over the top that can be intercepted. If your players reach in and try to steal the ball it will more often than not result in a foul call. Instead, on the trap players should be yelling out “Ball! Ball! Ball!” or “Trap! Trap! Trap!”. 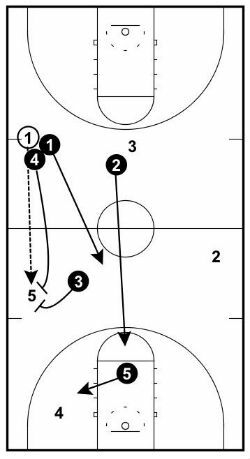 This will keep the energy of the team up while also further distracting the offensive player that is being trapped. When the trap happens the weak-side front-line player (X2) must immediately move into the middle of the floor and become and interceptor. The back line player (X3) is now the main interceptor and is in position to pick off any lob passes over the trap. The weak-side second line player (X5) now falls back and protects the basket from easy layups. This is the main stealing opportunity of the press where we want either interceptor to get a steal. A lot of teams will fall back into a man-to-man after the opposition beats this trap but there is an advanced and very effective second trap your team can implement once your team has mastered the first trap. 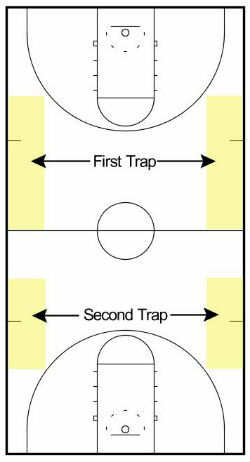 The second trap can be very effective if your players are smart enough to transition from the first trap to the second trap quickly enough. The second trap only occurs when the ball is lobbed straight down the line over the second line into the front court. This can only be used against the sideline on a straight line pass. It involves the back line player (X3) stopping the ball on the sideline and then a double team coming immediately from the ball-side second line player (X4). 1. Since the main ball-handlers bring the ball down the court and have thrown the lob pass to this player, it will often end up in the hands of a big player that isn’t used to passing or dribbling under pressure. 2. The opposition won’t be expecting it. 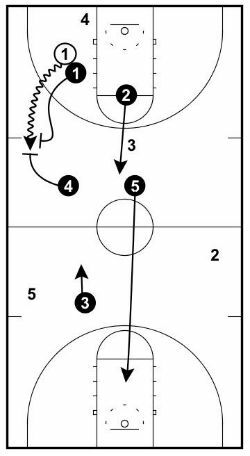 Most 2-2-1 presses end after the first trap and use this lob pass over the top to break the press before the point guard comes and receives the easy pass before setting up their half-court offense. We don’t allow that by trapping again and keeping constant pressure. We don’t allow that by trapping again and keeping constant pressure. Regardless of whether the ball is passed before the first trap or during the first trap, as soon as the ball is passed straight down the line it’s an immediate trap from the back line player and the ball-side second line player. The weak-side second line player (X5) is still protecting the basket or the ball-side baseline player if there is one there. The ball-side front line player (X1) should try and take away the easy pass to the closest guard. And then it’s the role of the front-line weak side player (X2) to try and intercept a lob pass to the other two players on the floor. This is a very effective trap once it has been drilled to your team and is fantastic and continuing to disrupt the tempo of the opposition. What if the press is broken? If the ball is dribbled or passed into the middle of the press, that’s our trigger that the press has been beaten. 1. If the press is beaten in the front court, X1 and X2 can look to double the ball or get a tap from behind. If they double the ball X4 and X5 become the interceptors while X3 stays back and protects the ring. 2. Closest player contains and slows down the ball while everyone else hustles back and communicates so that everyone has a player and we can set up our man-to-man half court defense. I’ve found trapping with the two guards to be complicated and ineffective. I prefer my teams to go with option two which is much simpler for youth players and allows us to set up our half court defense and play from there. To Deny or Not to Deny? A variation you can use for the 2-2-1 is to deny the inbounds pass instead of allowing the opposition to enter the ball uncontested. By denying the inbounds pass the 2-2-1 becomes a full-court press. Instead of waiting on the elbows, X1 and X2 face-guard their opposition players while the other three players stay in their normal roles in the press. 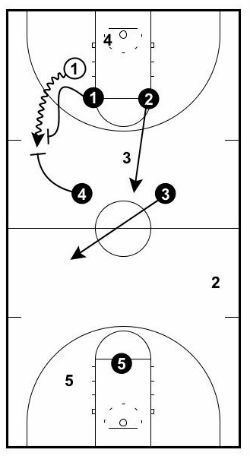 By face-guarding there’s a chance the front line players will get a deflection or the in-bounder will try to lob the basketball over top and the middle line (X4 and X5) can anticipate the steal. Denying the ball in a 2-2-1 press will confuse the offensive team because it looks like a full-court man-to-man. As soon as the ball has been inbounded the on-ball defender takes a step off and resumes channeling the basketball down the sideline, while the weak side front-line player sprints to their position as interceptor/help defender in the middle of the floor. The conservative 2-2-1 press is a variation of the 2-2-1 that I’ve used when the team I’m coaching has one big and fairly unathletic player that I would rather have stay back and defend the ring at all times. Many coaches use this version without considering the original 2-2-1 because they assume the biggest player on the team should always be all the way back. The main difference with this variation is instead of the main interceptor being the back line player (X5), it now becomes the weak-side middle line player (X3). This player must sprint laterally across the court looking to make an interception instead of falling back to protect the ring. This allows the back line player to stay back and protect the ring without coming up and gambling for interceptions. The two front line players (X1 and X2) still play exactly the same role as well as the middle line player that traps the basketball (X4). The only other big difference using this version of the press is it’s much harder to create the second trap effectively so I usually take it out of the 2-2-1 press altogether. I find this variation to be less effective at stealing the ball compared to the back line player being the main interceptor, but if you have the right personnel, it’s great to be able to still run the press while still guarding the ring with your big player. The 2-2-1 press is very effective at disrupting the tempo of the opposition. By forcing them to play fast and slow at the same time, the opposition will find it incredibly hard to ever get into a rhythm on offense which is exactly what the 2-2-1 press sets out to achieve. If you’re willing to prioritize some time in your practice to work on the press, and if you’re players are willing to work hard when they’re on the floor, the 2-2-1 can be very effective for your team.